In this reality competition show, cameras follow sixteen to twenty contestants that have been dropped off in a remote area of the world. Using their wits and available materials, each tries to survive the elements and each other’s strategies in order to win a check for $1 million dollars. 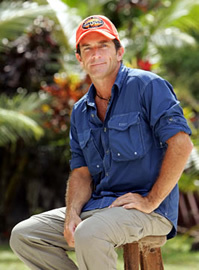 Hosted by Jeff Probst, participants are usually divided into two tribes. Tribes are then separated from one another as they work together to build a camp and gather food and water. Every third day, they are reunited to participate in either a luxury or immunity challenge. The luxury competition pits the tribes against one another in order to win such comforts as food treats, flint for making fire, matches, rain gear, blankets, or even trips away from the island. In the immunity challenges, teams compete for immunity from elimination. At the end of each episode, losing tribe members participate in the Tribal Council and vote out a fellow tribemate. When there are eight to ten participants left in the game, the tribes merge and everyone plays as an individual. The final group of contestants who’ve been voted out of the game remain at an undisclosed location, form the final Tribal Council jury, and silently observe Tribal Council ceremonies. In the end, the jury members vote individually on which of the final two or three surviving contestants should win the million dollar prize — the person who not only survived, but thrived in the process. Survivor: Renewed for 2012-13; Will Jeff Probst Return? Cannot believe these people know they are going to an Island In the South Pacific and no one Is able to make fire ? How crazy Is that ! Is that part of the script ? Boston Rob rubbed 2 pieces of bamboo together and had a fire within minutes ! Then there was Ghost Island…. worse ending of all time..
HOW do you allow the LOOSER to pick the winner ????? I”m pretty sure the LOSERS (jury) have always picked the winner in the past. I see no problem with the way it ended. My favorite show of all times!!!!!!!!!!!!!!!!!! My family and friends all watch Survivor. We cant wait till the next season. We love it and all the tactics the players use. We call each other after every episode and we have our favourites in the game. Please dont cancel it. The people are getting worse After what seen this past Survivor. I am no longer to watch it It getting worse. This is a ridiculous, stupid show. Cancel it. Who cares. I saw one episode several years ago—-That was more than enough! I really dislike the whole concept of Survivor – it is everything bad about human beings shown as winning the game. Ugh! I am old-fashioned – I like honesty, manners, generosity and other such relics of society. Silly me!